Posted by sazeve in Blogroll, IBA news, Personal Perspectives, Sakya. In November IBA staff and students took a well deserved break from their hard studying and decamped to Lumbini to attend the annual Sakya monlam. This year there were additional celebrations for the Golden Jubilee anniversary of the enthronement of HH Sakya Trizin. The programme included a grand Long Life offering ceremony, a series of public talks in the Mahadevi temple garden focussing on the topics of Environmental Protection and Climate Change and World Peace and a Jubilee Gala of speeches, music and dancing in the pavillion. 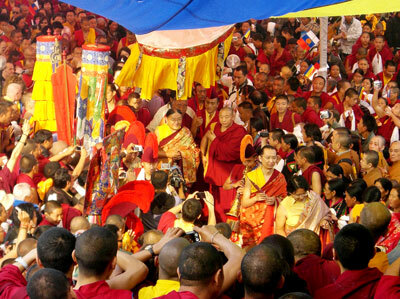 In the midst of thousands of monks and nuns, IBA monks assembled in the grounds of Tashi Rabten Ling Monastery, with offerings to present to HH Sakya Trizin during his Tenzhug Ceremony. IBA formed group number 119 in the mornings offerings proceedings! Carlos, our volunteer Spanish teacher, recalls: ‘ HH speech on caring for the environment highlighted the connection between one’s inner emotions and the outer environment. Whatever you feel, if you help those around you to feel better, the environment around us will improve. If you take care of your mind, naturally your care will extend to those around you and the environment – the trees, the animals, nature and so on – will automatically be taken care of. Our IBA Director, Khenpo Ngawang Jorden-la delivered an inspring speech about the importance of environmental protection. This is Tom (pictured above), who is our fine gap year volunteer teacher for B group (intermediate level) English language student monks. 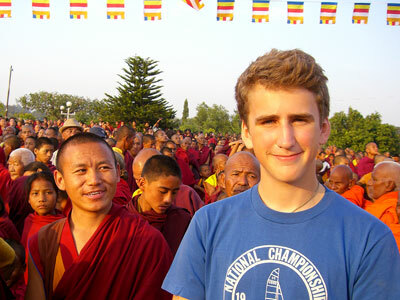 This was his first monlam experience and provided him with a full-on immersion in Buddhist culture. Cosy night times were spent camping in the IBA monastic tent in a field with about 4000 other monks. Posted by Karen in Blogroll, Courses, International Buddhist Academy, Personal Perspectives. Sixty-five students from more than thirty different countries, ( including Russia, Guatemala, Switzerland, Peru, New Zealand, Estonia, South Africa, Belgium, Georgia, The Netherlands, Argentina, Honduras, Brazil and Portugal ) have registered for studies at the International Buddhist Academy in Kathmandu this year. Such a genuinely “International” atmosphere stimulates a great deal of appreciation for what we share in common as practitioners, no matter where we are from. 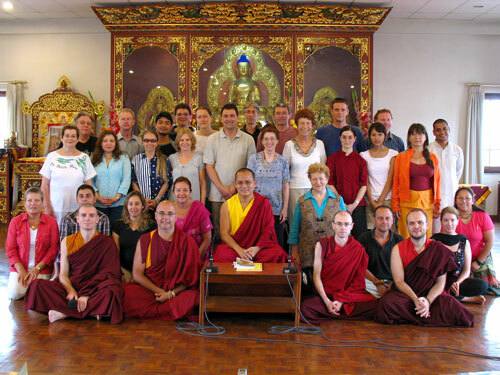 The great value we have placed on receiving authentic Dharma teachings from highly qualified teachers led many of us to travel half-way across the world to study the Bodhicharyavatara, a renowned classic by one of the greatest realized Buddhist masters and scholars of ancient India, Arya Shantideva. Since this powerful text contains so many direct and vivid reasonings regarding each aspect of practice in the Paramitayana, it has been divided into two parts, the first part taught this year, and the second part, (another month-long course), in 2009. Khenpo Jamyang Tenzin taught using an English translation of the root text, and consulted a Tibetan commentary. But additionally, to our great benefit, he also drew deeply from his own experiences of monastic life. 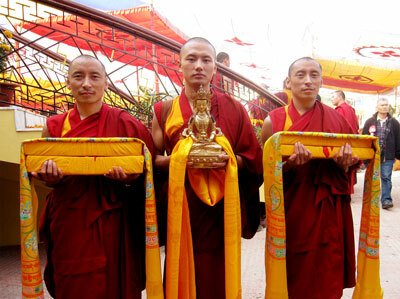 The challenges and responsibilities that we imagine to be unique to our “house-holder” existence were revealed by our beloved Khenpo as the ever-present constants of human life everywhere. Our Khenpo’s honesty about his struggles, and his advice to us, was refreshing and generous, and set the tone for our own introspective tasks, guided by Shantideva’s courageous self-examination and rigorous destruction of all excuses for harm and ignorance. All of us who experienced this course on the Bodhicharyavatara have shared an opportunity to take home something infinitely precious, something to nourish with our growing understanding. The chapter on Patience (Forbearance) was deeply challenging, a vast and daunting topic, both for contemplation and for practice. I hope that my efforts to better develop Patience over the coming year will bear some fruit, and that through such efforts, I will be more ready to meet the great Arya Shantideva’s presentation on Meditation and Wisdom, for the second part, in summer 2009. Please join us then! Posted by belen in Blogroll, Personal Perspectives. Almost one year ago, inspired by H.H. Sakya Trizin´s Vajrayogini teachings in Spain, I started to practice yoga on a daily basis, and seeing the results in my body(more flexibility, strength and vitality) the desire to become a yoga teacher-practitioner developed, too. But what surprised me most was the endurance that yoga gives, and the fact that with this endurance, the body can easily stand longer hours of meditation without so many bodily aches and pains, and without feeling one has to move positions so often. The body’s activity is accompanied by the activity of the mind, and as a result I have found that I can bear new, uncomfortable situations in life with more peace and tranquillity. I don’t experience so much mental stress or anxiety because I trust things more and don’t react to them as I used to. This immediate benefit makes me want to get out of bed when it is so cosy and nice in there, and my mind would like to dwell in old habitual thinking patterns of laziness and procrastination. 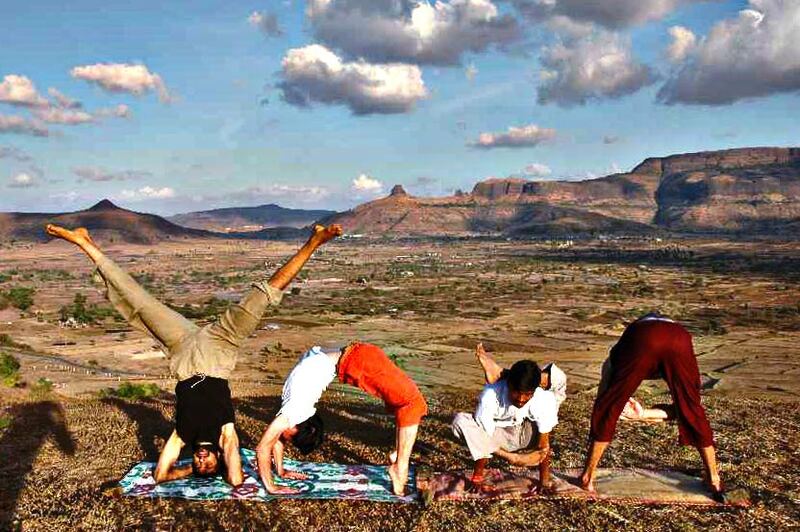 This is another effect of yoga, it has the power to ignite positive energy and enthusiasm in one´s day, while providing a stable platform on which to build new, healthy and positive habits for oneself. I like having yoga practice as my breakfast, as my travel companion everywhere, stretching at a bus stop or at airports. It feels as if a sudden breath of fresh air comes into my mind and makes me appreciate everything and everyone with a new light…it makes mind transformation easier when we can accompany it with the body, and we can become more agile and lighter in the process. It is so joyful to feel no pain in the body and to know, with meditation, that it is, after all, impermanent.